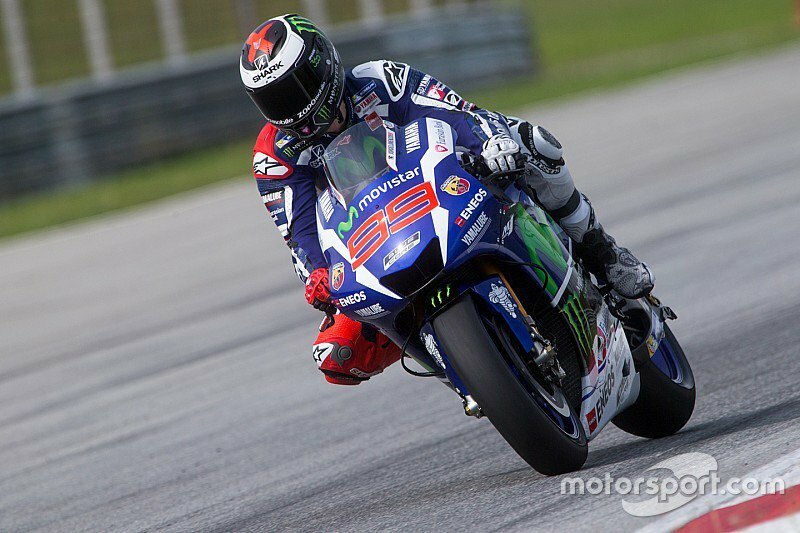 Jorge Lorenzo backed up his 2015 MotoGP™ World Championship by dominating the first test of 2016. A damp track early on Wednesday morning delayed track action for over two hours on the final day of the Sepang test. It was Yamaha test rider Katsuyki Nakasuga who was the first out on track, testing conditions for the rest of the field. Slowly more and more riders joined the action and with just over five hours of testing remaining the majority of the field were on track. Andrea Iannone was an early leader as the conditions continued to improve. The Italian suffered a small fall and was unhurt. The first benchmark lap came from Jorge Lorenzo, the Movistar Yamaha MotoGP rider one of the last to join the action on track but setting a 2’00.882 on just his fourth lap. With five hours to go Lorenzo led from Casey Stoner, the Australian impressing many as he continued to test the GP15 for Ducati. As Jorge Lorenzo improved his time to a 2’00.016, Valentino Rossi also improved to a 2’00.556 to make it a Movistar Yamaha one two, the pair split by 0.540s. Third was Marc Marquez, just over a second slower than Lorenzo. During this period of dry conditions there were falls for Yonny Hernandez at Turn 1 and an off for Tito Rabat at Turn 5, his Estrella Galicia 0,0 Marc VDS machine suffering damage but the rookie walking away unhurt. After a an stellar Tuesday, Wednesday proved to be more difficult for Octo Pramac Yakhnich’s Danilo Petrucci as the Italian suffered an engine freeze when shifting from fourth to first at T9. This forced his team to change the engine, a process taking two hours. With over three and a half hours of testing remaining rain started to fall yet again, quickly sending riders into the pits. The rain would eventually lift and the final hour saw a flurry of activity as riders pushed for one last quick lap. 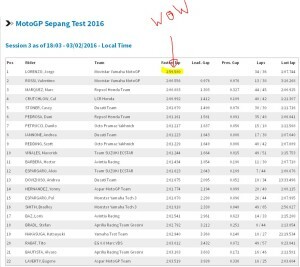 It was Jorge Lorenzo who topped the Sepang test with an incredible 1’59.580 set on a hard rear and new Michelin front, the factory Yamaha rider dipping under the 2’00 barrier with two laps in the 1’59s. This was not only the fastest lap of the day but of the test as a whole, over half a second clear of anyone else. Second on combined times was Petrucci, with his 2’00.095 set on the soft tyre on Tuesday. Avintia Ducati’s Hector Barbera was another to benefit from an early soft tyre run on Tuesday, ending the three-day event in third and just over 0.8s off Lorenzo’s time. As with Lorenzo, Rossi’s best time came on the hard tyre on Wednesday as the Italian cemented the Movistar Yamaha MotoGP team well inside the top five on combined times and ended 0.976s back on his teammate. Repsol Honda’s Marc Marquez completed the combined top five, his 2’00.843 the fastest lap by a Honda rider. Interestingly, all of Lorenzo’s best times from each of the three days would have placed him inside the combined top five. Sixth overall was LCR Honda’s Cal Crutchlow thanks to his 2’00.899. It was the Ducati of Scott Redding who ended the test seventh overall, his fastest time coming on Tuesday, although the Brit showed solid pace in the closing half hour of Wednesday. Andrea Iannone was only 0.003s behind the satellite rider and was the leading factory Ducat, his best time coming on the new 2016 Ducati. Meanwhile Casey Stoner made it three Ducatis in a row as the Australian set a 2’01.070 on the final day and ended ninth. With over 150 laps across the three days of testing, Bradley Smith leaves satisfied and inside the top ten, 1.5 seconds behind Lorenzo’s lap and ahead of Dani Pedrosa, the Repsol Honda rider having a mixed test overall. Maverick Viñales led the Suzuki pair in 12th with Aleix Espargaro just behind. Team Suzuki Ecstar are planning to debut their fully seamless gearbox in Australia with their test team before the Spanish duo get their hands on it in Qatar. Yonny Hernandez impressed in 14th, ahead of Andrea Dovizioso who set a best time of 2’01.675. Pol Espargaro had suffered two crashes on Tuesday at Turn 5 but was able to improve his time on the final day, placing him 16th overall as the flag came out. MotoGP™ rookie, Tito Rabat, ended his second official MotoGP™ test in 17th and within three seconds of the top. Despite not having access to a new bike or new parts, Stefan Bradl managed a respectable 18th. After falling at 290km/h on Tuesday, Loris Baz improved his time on Wednesday to end the test inside the top 20 and ahead of Yamaha test rider Katsuyuki Nakasuga. Alvaro Bautista was 21st with a 2’02.876 as he prepares to debut the new Aprilia during a private outing in Qatar. Eugene Laverty was also back on track on Wednesday, missing Tuesday due to a heavily sprained right wrist suffered in a Monday crash and ending just behind Michele Pirro. The MotoGP™ World Championship return to action on the 17th of February in Phillip Island.